El Niño is a meteorologic/oceanographic phenomenon that occurs sporadically (every few years) at low latitudes. It is felt particularly strongly in the eastern Pacific region, notably from the equator southwards along the coasts of Ecuador and Peru. The El Niño is a component of the ENSO (El Niño Southern Oscillation) which accentuates the intimate and causal connection between atmospheric and marine processes. Obvious manifestations of El Niño in the eastern Pacific are anomalous warming of the sea; reduced upwelling; a marked decline in fisheries, and high rainfall with frequent flooding. 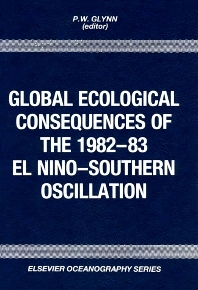 The 1982/83 El Niño was exceptionally severe, and was probably the strongest warming of the equatorial Pacific Ocean to occur during this century. The warming was intense and spread over large parts of the Pacific Ocean and penetrated to greater depths than usual. Many eastern Pacific coral reefs that had exhibited uninterrupted growth for several hundred years until 1983 were devasted by the disturbance and are now in an erosional mode. Marine species were adversely affected. The consequent depletion of the plant food base resulted in significant reductions in stocks of fish, squid etc. This led to a mass migration and near-total reproductive failure of marine birds at Christmas Island. Emphasis in this volume is placed on disturbances to benthic communities; littoral populations; terrestrial communities and extratropical regions.